completed his Masters in Technology (Mechanical Engineering Design) from the Priyadarshini College of Engineering, Rashtrasant Tukodoji Maharaj Nagpur University, Nagpur (R.T.M.N.U. Nagpur). He acquired his Bachelor’s of Engineering Degree from Karamveer Dadasaheb Kannamwar College of Engineering Nagpur (K.D.K.C.O.E., R.T.M.N.U., Nagpur). He worked as a Lecturer in Department of Mechanical Engineering of Nagpur Institute of Technology, Nagpur. As also a Lecturer in Department of Mechanical Engineering of Nagpur Polytechnic Nagpur. Readers can contact him at durgeshverma1210@gmail.com. 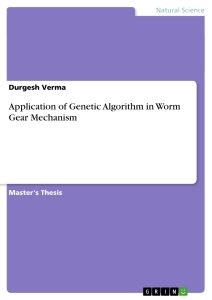 In this study, a foundation and solution technique using Genetic Algorithm (GA) for design optimization of worm gear mechanism is presented for the minimization of power-loss of worm gear mechanism with respect to specified set of constraints. Number of gear tooth and helix (thread) angle of worm are used as design variables and linear pressure, bending strength of tooth and deformation of worm are set as constraints. The GA in Non-Traditional method is useful and applicable for optimization of mechanical component design. The GA is an efficient search method which is inspired from natural genetics selection process to explore a given search space. In this work, GA is applied to minimize the power loss of worm gear which is subjected to constraints linear pressure, bending strength of tooth and deformation of worm. Up to now, many numerical optimization algorithms such as GA, Simulated Annealing, Ant-Colony Optimization, Neural Network have been developed and used for design optimization of engineering problems to find optimum design. Solving engineering problems can be complex and a time consuming process when there are large numbers of design variables and constraints. Hence, there is a need for more efficient and reliable algorithms that solve such problems. The improvement of faster computer has given chance for more robust and efficient optimization methods. Genetic algorithm is one of these methods. The genetic algorithm is a search technique based on the idea of natural selection and genetics. Genetic Algorithm (GA) maintains a population of encoded solutions, and guide the population towards the optimum solutions. Fitness function provides a measure of performance of an individual how fits. Rather than starting from a single point solution within the search space as in traditional optimization methods, the genetic algorithm starts running with an initial population which is coding of design variables. GA selects the fittest individuals and eliminates the unfit individuals in this way. An initial population is chosen randomly at the beginning, and fitness of initial population individuals are evaluated. Then an iterative process starts until the termination criteria have been run across. After the evaluation of individual fitness in the population, the genetic operators, selection, crossover and mutation are applied to breed a new generation. Other genetic operators are applied as needed. The newly created individuals replace the existing generation and re-evaluation is started for fitness of new individuals. The loop is repeated until acceptable solution is found. Genetic Algorithms (GA) are computerized search and optimization algorithms based on the mechanics of natural genetics and natural selection. Professor John Holland of the University of Michigan, Ann Arbor envisaged the concept of these algorithms in the mid-sixties and published his seminal work (Holland, 1975). Thereafter, a number of his students and other researchers have contributed to developing this field. To date, most of the GA studies are available through a few books (Davis, 19001; Goldberg, 1989; Holland, 1975; Michalewicz, 1992) and through a number of international conference proceedings (Belew and Booker, 1991; Forrest, 1993; Grefenstette, 1985, 1987; Rawlins, 1991; Schaffer, 1989, Whitley, 1993). An extensive list of GA-related papers is referenced elsewhere (Goldber, et. al, 1992). GAs are fundamentally different than classical optimization algorithms. In the above equation, the variable xi is coded in a substring si is calculated like for example for four-bit string (0111) has a decoded value equal to [(1)2 + (1) 21 + (1)22 + (0)23 ] or 7. It is worthwhile to mention here that with four bits to code each variable, there are only 24 or 16 distinct substrings possible, because each bit-position can take a value either 0 or 1. The accuracy that can be obtained with a four-bit coding is only approximately 1/16th of the search space. But as the string length is increased by one, the obtainable accuracy increases exponentially to 1/32th of the search length. The length of a substring representing a variable depends on the desired accuracy in that variable. Generalizing this concept, we may say that variable is approximately (xi(U) - xi(L)) / 2ℓi. Once the coding of the variables has been done, the corresponding point x = (x1, x2, …., xN)T can be found using Equation (1). Thereafter, the function value at the point x can also be calculated by substituting x in the given objective function f(x). This transformation does not alter the location of the minimum, but converts a minimization problem to an equivalent maximization problem. The fitness function value of a string is known as the string’s fitness. The operation of Gas begins with a population of random strings representing design or decision variables. Thereafter, each string is evaluated to find the fitness value. The population is then operated by three main operators - reproduction, crossover, and mutation- to create a new population of points. The new population is further evaluated and tested for termination. If the termination criterion is not met, the population is iteratively operated by the above three operators and evaluated. This procedure is continued until the termination criterion is met. One cycle of these operations and the subsequent evaluation procedure is known as a generation in GA’s terminology. Reproduction - Reproduction is usually the first operator applied on a population. Genetic algorithm (GA) maintains a population of encoded solutions, and guide the population towards the optimum solutions. Fitness function provides a measure of performance of an individual how fits. Rather than starting from a single point solution within the search space as in traditional optimization methods, the genetic algorithm starts running with an initial population which is coding of design variables. GA selects the fittest individuals and eliminates the unfit individuals in this way. An initial population is chosen randomly at the beginning, and fitness of initial population individuals are evaluated. Then an iterative process starts until the termination criteria have been run across. After the evaluation of individual fitness in the population, the genetic operators, selection, crossover and mutation are applied to breed a new generation. Other genetic operators are applied as needed. The newly created individuals replace the existing generation and revaluation is started for fitness of new individuals. The loop is repeated until acceptable solution is found. Each of these operators is explained and demonstrated in following: the selection operator used in this study is a tournament selection. Tournament selection approach works as follows and shown in Figure a pair of individuals from mating pool is randomly picked and the best fit two individuals from this pair will be chosen as a parent. Each pair of the parent creates two Child as described in the method of single point crossover shown in Table . A single point crossover operator is used in this study. Crossover is very important in the success of the genetic algorithm. This operator is primary source of new candidate solutions and provides the search mechanism that efficiently guides the evolution through the solution space towards the optimum. In single point crossover, cuts two chromosomes in one point and splices the two halves to create new ones. In Table , the strings, Parent I and Parent II, are selected for crossover and the genetic algorithm decides to mate them. The crossover point has been chosen at position 17. The parent exchanges the sub-strings, which occurs around crossing point that is selected randomly. The newly created strings are Child I and Child II. The Cycle starts again with selection. This iterative process continues until specified criteria are met. Hyperrealismus und Selbstreferentialität in Hideo Kojimas "Metal Gear Solid"
Der Reichstag zu Worms 1495. Ablauf, Verhandlungspunkte, Ergebnisse und eigentliche Absichten Maximilians I.